The 2017 MLS schedule is out! Here are the highlights from the release of the slate, which includes expansion teams Atlanta and Minnesota. Get your planners out: The entire 2017 MLS regular season schedule has been released, which means you can finally start marking your calendars with key dates from another summer of soccer in the United States. This season features the addition of two expansion teams in Minnesota United FC and Atlanta United, a couple of new stadiums, and a greater presence on broadcast television than before. It all kicks off March 3 in Portland, when Minnesota takes on the Timbers at Providence Park (the league had previously released the home openers for every team) and picks up steam from there. The league will observe a break in play for the Gold Cup group stage for the first time, remaining off from July 7-16, with Sporting Kansas City and Philadelphia playing the last game before the break on July 6. Matches will also be played on July 1-5, which means multiple teams will still be without their international players involved in the Gold Cup for at least one game, if not more. MLS play resumes on July 19, three days after the end of the Gold Cup’s group stage. Minnesota welcomes MLS Cup champion Seattle to Minneapolis on Aug. 5, then travel to the home of the champions on on Aug. 20 in a nationally televised game on FS1. Minnesota head coach Adrian Heath only faces his former team Orlando City once—when the Lions visit the Twin Cities on Saturday, May 27. The Loons have two obvious geographic rivals in Kansas City and Chicago; They host Kansas City on May 7 before traveling to Children’s Mercy Park on June 3—those games will be nationally televised on FS1 and ESPN, respectively. Minnesota faces Chicago once, in Chicago, on Aug. 26. Atlanta United gets an early test with its ambitious roster, visiting the champion Sounders on March 3 in a nationally televised game on FS1. Atlanta plays its closest geographic rival Orlando City three times: At Orlando on Friday, July 21 on ESPN, then nine days later when it hosts the first event at the new Mercedes-Benz Stadium on FOX. Atlanta plays Orlando once more at home on September 16 on Univision. The Raleigh bid for an MLS expansion team unveiled a stadium plan for a downtown venue within the boundaries of Peace St., Salisbury St., Lane St. and the N.C. Railroad easement. David Beckham's ownership group in Miami has released a rendering for a stadium in the Overtown neighborhood, the latest desired site for an MLS expansion bid that kicked off in 2014. FC Cincinnati doesn't yet have a nailed-down location for an MLS stadium, but the expansion hopeful has released renderings for a 25,000-seat stadium inspired by Bayern Munich's Allianz Arena. 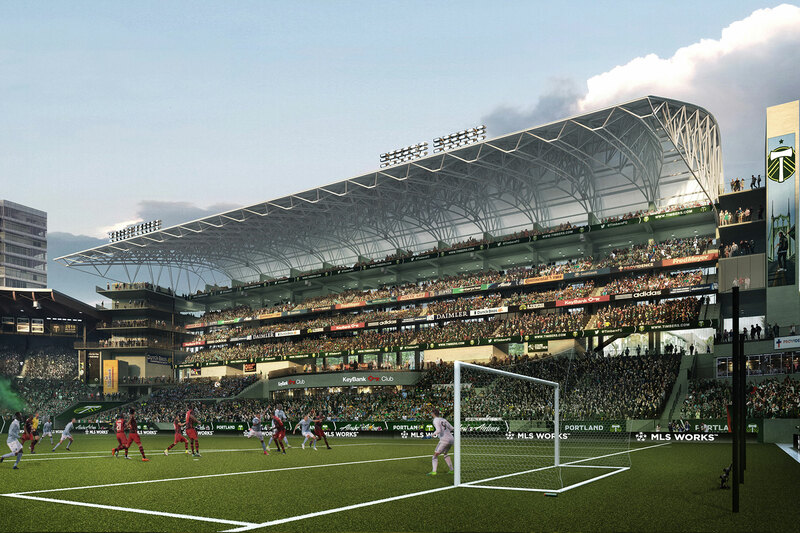 The Timbers are adding 4,000 seats as part of a $50 million renovation to Providence Park. Atlanta United will share Mercedes-Benz Stadium along with the Atlanta Falcons in a state-of-the-art venue. 2017 MLS expansion team Minnesota will eventually move to its new soccer-specific venue in St. Paul. Sacramento Republic has been pushing hard for an MLS team, with Don Garber acknowledging the USL side is one of the leaders of the pack for when the league expands to 28 teams. LAFC has broken ground on Banc of California Stadium at the site of the L.A. Memorial Sports Arena. D.C. United is aiming to put an end to a seemingly never-ending quest to move out of RFK Stadium to its own venue and it claims it will begin play at Audi Field at D.C.'s Buzzard Point in 2018. St. Louis's MLS expansion bid has picked up considerable steam, with Don Garber confirming it's one of two, along with Sacramento, in the lead for spots 24-28. A group led by NBA owners Dan Gilbert and Tom Gores is aiming to bring MLS to Detroit with this downtown venue. 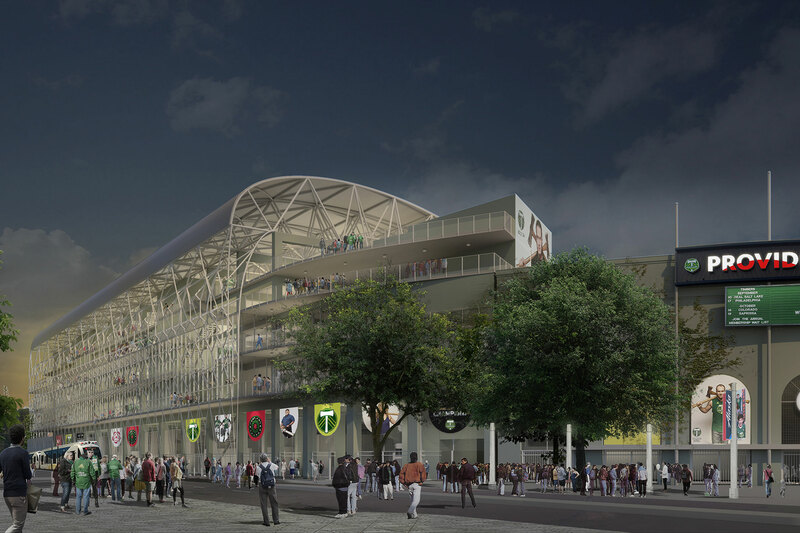 The Tampa Bay Rowdies announced their plans to launch an aggressive bid for an MLS expansion spot, full with these renovations to the existing Al Lang Stadium. The group behind San Diego's push for an MLS expansion team revealed its plans for a shared, 30,000-seat stadium with the San Diego State University football team on the site where Qualcomm Stadium currently stands. The NASL's Indy Eleven emerged as a late contender for MLS expansion, becoming the 12th bid to be submitted to the league. USL's Phoenix Rising FC aims to snag one of MLS's four expansion berths with this stadium and training field complex. Charlotte's MLS bid includes this downtown soccer-specific venue. MLS expansion in recent years has introduced two of the most highly anticipated rivalries to the league: The Hudson River Derby between NYCFC and New York Red Bulls, and the Cascadia Cup between the Seattle Sounders, Portland Timbers, and Vancouver Whitecaps. In the case of the Cascadia Cup, each of the three matches between Seattle and Portland will put the last two MLS Cup winners against each other. The Seattle Sounders and Toronto FC will meet in a rematch of the 2016 MLS Cup final on Saturday, May 6 in a nationally-televised game on ESPN. This time, though, the Sounders will have home-field advantage at CenturyLink Field. How does the Chargers' move to Los Angeles impact the Galaxy, MLS expansion? Sunday, October 22, will be Decision Day, where any down-to-the-wire playoff chances or Supporters’ Shield races will get decided. All 11 games in the league that day will kick off at 4 p.m. Among the more interesting matchups on paper is Sporting Kansas City’s visit to Real Salt Lake in a rematch of MLS Cup 2013, Portland hosting Vancouver in a potential Cascadia Cup decider, and D.C. United hosting the New York Red Bulls in another edition of those teams’ long-standing rivalry–in what could be the last MLS match played at RFK Stadium.